"Fast Random Walk with Restart and Its Applications"
Authors; Hanghang Tong, Christos Faloutsos, and Jia-Yu Pan, ICDM 2006, will be awarded the 10 Year Highest-Impact Paper Award at the IEEE ICDM 2015 Conference in Atlantic City, NJ. IEEE International Conference on Data Mining is one of the top data mining conferences. The paper had also won the 'best research paper' award that year. It shows how to quickly compute the so-called 'personalized random walk with restarts', to estimate node proximity, with applications in image captioning and co-authorship graphs. The paper has accumulated 433 citations on Google Scholar as of today. 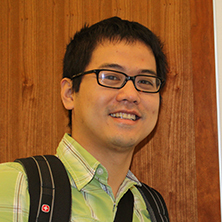 Professor Hanghang Tong (ML PhD'09) is now tenure-track faculty at Arizona State University, and Dr. Jia-Yu Pan (PhD/CSD) is now with Google.